Nob Hill is a unique neighborhood developed between the 1920's and 1950's, home to many Historic Places on the National Register. 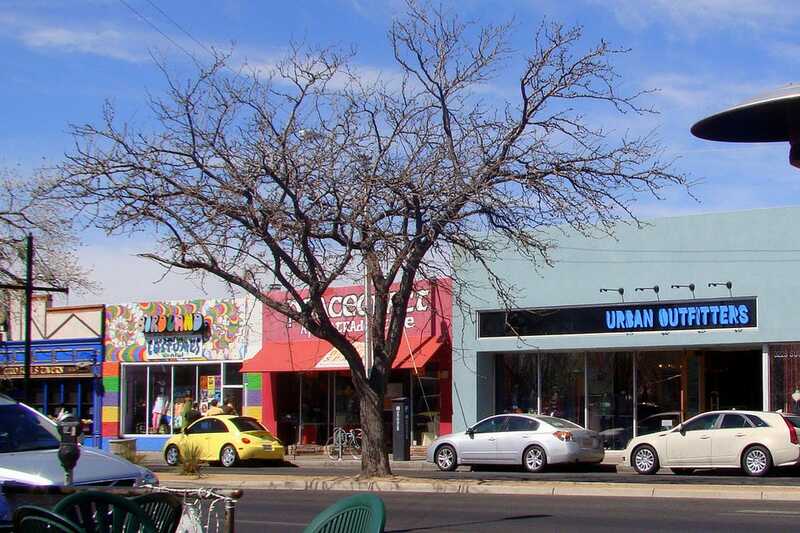 It consists of a thriving business district along Central Avenue (the historic Route 66) full of restaurants, brew pubs, unique shops, theaters and the surrounding neighborhoods. The famous Route 66, or Historic Route 66 as it is now known, runs the entire length of Albuquerque and is known as Central Avenue, which passes through the Nob Hill neighborhood. For the notstalgic, remnants of days gone by still remain, such as neon signage and the original Nob Hill Business Center, the landmark of this area, built in 1946 and the first modern suburban shopping center in New Mexico. The Route 66 Summerfest takes place every July. Zinc Wine Bar and Bistro is an elegant upscale restaurant perfect for taking an out of town-er to show off how Albuquerque has grown up as a city - it effuses urban chic. Check out their Cellar Bar's happy hour menu, drinks and live music. Cosmo Tapas is a great place for a light meal and enjoying Brazilian Jazz music on the weekends. Go to Yanni's for the upscale decor and great Greek food. At Scalo Northern Italian Grill in Nob Hill of Albuquerque, you'll find great music with no cover in their lounge, located adjacent to the restaurant, called Il Bar. Hosting music groups almost nightly, you can experience everything from soul R&B to jazz to folk rock. Kellys Brew Pub is a converted filling station, providing lots of outdoor tables and is a popular hangout. Imbibe has a fun roof top bar and dance floor downstairs. Mariposa Gallery is in the heart of Nob Hill, next door to Scalo Northern Italian Grill. Mariposa is for those who appreciate the unique and sometimes whimsical, in art, jewelry and clay pieces. This successful gallery has been on the Albuquerque scene since 1974. Beeps, in Nob Hill Business Center, is the place to go for cards and unusual fun gift items. Off Broadway is your source for vintage clothing and accessories, with rentals available.